tblFEStatsBrowsers has got 553 rows. tblFEStatsPaperHits has got 47.974.301 rows. There's a clustered index on tblFEStatsPaperHits that does not include BrowserID. Performing the inner query will thus require a full table scan of tblFEStatsPaperHits - which is totally OK. Currently, a full scan is executed for each row in tblFEStatsBrowsers, meaning I've got 553 full table scans of tblFEStatsPaperHits. Now this isn't as much a question of how to fix this - I can either use the OPTION (HASH JOIN) or create a temp table manually. I'm more wondering why the query optimizer would ever use the plan it currently does. Since the QO doesn't have any stats on the BrowserID column, I'm guessing it's assuming the worst - 50 million distinct values, thus requiring quite a large in-memory/tempdb worktable. As such, the safest way is to perform scans for each row in tblFEStatsBrowsers. There is no foreign key relationship between the BrowserID columns in the two tables, so the QO can't deduct any info from tblFEStatsBrowsers. Is this, as simple as it sounds, the reason? "I'm more wondering why the query optimizer would ever use the plan it currently does." To put it another way, the question is why the following plan looks cheapest to the optimizer, compared with the alternatives (of which there are many). Note that the estimated number of rows is 185,220 (not 289,013) since the equality comparison implicitly excludes NULL (unless ANSI_NULLS is OFF). The estimated cost of the above plan is 206.8 units. The estimated cost is now 0.00452 units. The addition of the Top physical operator sets a row goal of 1 row at the Top operator. The question then becomes how to derive a 'row goal' for the Clustered Index Scan; that is, how many rows should the scan expect to process before one row matches the BrowserID predicate? The statistical information available shows 166 distinct BrowserID values (1/[All Density] = 1/0.006024096 = 166). Costing assumes that the distinct values are distributed uniformly over the physical rows, so the row goal on the Clustered Index Scan is set to 166.302 (accounting for the change in table cardinality since the sampled statistics were gathered). In practice, it is very unlikely that the first 166 rows scanned from the index (in whatever order they happen to be returned) will contain one each of the possible BrowserID values. Nevertheless, the DELETE plan is costed at 1.40921 units total, and is selected by the optimizer for that reason. Bart Duncan shows another example of this type in a recent post titled Row Goals Gone Rogue. That plan has an estimated cost of 40729.3 units. Another way to 'fix' the original query would be to create the missing index on BrowserID that the execution plan reports. Nested loops work best with when the inner side is indexed. Estimating cardinality for semi joins is challenging at the best of times. Not having proper indexing (the large table doesn't even have a unique key!) will not help at all. When I run your script to create a statistics only database and the query in the question I get the following plan. 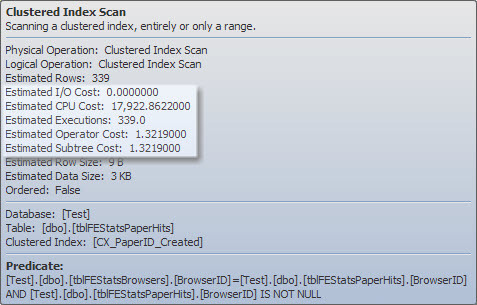 So it estimates that it will need to perform the scan on tblFEStatsPaperHits 339 times. Each scan has the correlated predicate tblFEStatsBrowsers.BrowserID=tblFEStatsPaperHits.BrowserID AND tblFEStatsPaperHits.BrowserID IS NOT NULL that is pushed down into the scan operator. The plan doesn't mean that there will be 339 full scans however. As it is under an anti semi join operator as soon as the first matching row on each scan is found it can short circuit the rest of it. The estimated subtree cost for this node is 1.32603 and the entire plan is costed at 1.41337. The overall plan is costed at 418.415 (about 300 times more expensive than the nested loops plan) with the single full clustered index scan on tblFEStatsPaperHits costed at 206.8 alone. Compare this with the 1.32603 estimate for 339 partial scans given earlier (Average partial scan estimated cost = 0.003911592). So this would indicate that it is costing each partial scan as being 53,000 times less expensive than a full scan. If the costings were to scale linearly with row count then that would mean that it is assuming that on average it would only need to process 900 rows on each iteration before it finds a matching row and can short circuit. 147 gives the closest estimated subtree cost to 0.003911592 at 0.0039113. Either way it is clear that it is basing the costing on the assumption that each scan will only have to process a tiny proportion of the table, in the order of hundreds of rows rather than millions. I'm not sure exactly what maths it bases this assumption on and it doesn't really add up with the row count estimates in the rest of the plan (The 236 estimated rows coming out of the nested loops join would imply that there were 236 cases where no matching row was found at all and a full scan was required). I assume this is just a case where the modelling assumptions made fall down somewhat and leave the nested loops plan significantly under costed. This gives you a materialized index one row per BrowserID, eliminating the need to scan 50M rows. The engine will maintain it for you and the QO will use it 'as-is' in the statement you posted (w/o any hint or query rewrite). The downside is of course contention. Any insert or delete operation in tblFEStatsPaperHits (and I guess is a logging table with heavy inserts) will have to serialize access to a given BrowserID. There are ways that make this workable (delayed updates, 2 staged logging etc) if you're willing to buy into it. Not the answer you're looking for? Browse other questions tagged sql-server-2008-r2 query optimizer or ask your own question. Why does SQL Server run a subquery for each row of the table it's qualifying? MySQL query optimizer ignoring smaller scan on TIMESTAMP column, cardinality? Cannot tune database any further; what next?